I remember a time in the not too distant past when the costumes in Downton Abbey were weekly fodder in the sewing blogging world. Lady Mary this, Countess Cora that… At the time I hadn’t yet watched the show (I got rid of my TV several years ago because I had become addicted to say the least – cold turkey was my only saving grace! ), and I was desperate to figure out what this new-to-me show was all about. I read every Downton post I found in order to piece together the story that was gripping this community. I eventually watched the first season of the show with my neighbor, finally catching up with the online social scene while enjoying some in-real-life social time. A win, win if you ask me! So, when the good people at Interweave/F+W wrote to ask if I’d like to give away five copies of The Unofficial Downton Abbey Sews Magazine from the editors of Stitch Magazine, I immediately said, “Yes, please!” How could I not spread the Downton love? The fine print says that this magazine is unofficial and unauthorized, but that doesn’t stop it from being chock full of patterns inspired by the show. The projects are divided into four sections: Take Me Dancing, which includes fancy dresses and the like; Out and About, which includes casual and practical everyday wear; At Home, which includes home dec and nightgowns and robes and such; and, finally, From the Archives, which includes a hodge podge of everything else. There’s something about the blues and greens used in the Suffragette Day Blouse and Skirt (all of the pattern links here and below go to the corresponding free pattern download) that immediately drew me in to this section. 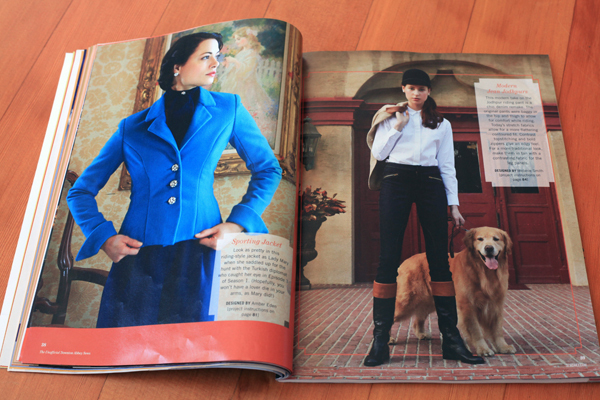 These two patterns were inspired by Lady Sybil and the outfit she wore to the political rally in Season 1. I don’t think I could personally pull off either of these garments since I’m not sure high-waisted skirts are for me (after trying one here), but I’d love to see this exact outfit on everyone else! The Maid’s Day Off Coat, however, is right up my alley. This pattern was inspired by Anna and the coat she wore to visit Bates in prison in Season 3. While I don’t have too many occasions to visit prison, I imagine I could find many other appropriate places to wear this coat! I also like the Sporting Jacket and the Modern Jean Jodhpurs. The jacket pattern was inspired by the jacket Lady Mary wore when she was horseback riding with the Turkish diplomat in Season 1. The Jodhpur riding pant pattern isn’t attributed to one particular point in the story, but it’s hard to imagine a list of Downton-inspired garments that doesn’t include Jodhpurs. The beautiful peacock feather is actually made by smocking. And, the directions don’t just assume that you know how to smock – there’s a whole sidebar detailing the technique. In fact, instructions for most of the projects require more than just the typical “sew right sides together”. This magazine details how to make puckered fabric, make a jeweled collar, sew with sequins, embroider, work with lace, make fringe, attach a coat lining, pad stitch, create welt pockets, make a fagoted seam, sew with French seams, add piping, make scallops, paper piece, make rosettes and other floral embellishments, and more. I learned a lot just reading the instructions! Now, that said, the instructions are mostly text with minimal figures. So, while there are a lot of techniques included in this magazine, you have to have the confidence to work mostly through text descriptions with a single key image. UPDATE: I forgot to mention that the magazine also has little blurbs about the designers. I love getting a little bit of insight into the people behind the patterns! For example, the Out and About Wrap was designed by Samina of Sew Everything Blog. She wrote about her design and how to wear the wrap as a scarf here. There are even two designers from the Seattle area: Charise of Charise Creates and Kerry Smith! 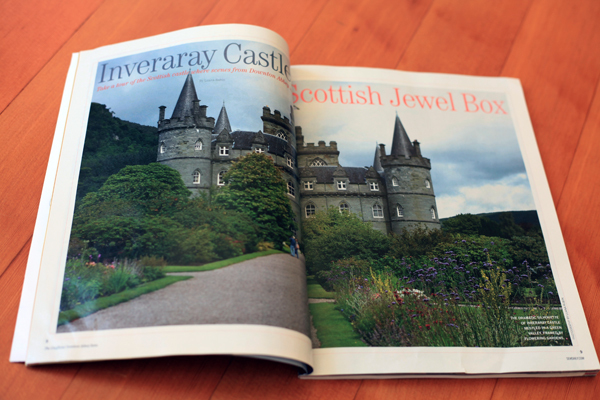 For true Downton junkies the magazine even includes sections devoted solely to the show, like the piece on the Inveraray Castle, the Scottish estate featured in the Christmas special. Now, typically when I review books and pattern collections like this I like to make one of the included garments so that you can get an idea of what is possible. Unfortunately, I just couldn’t find the time this time around (read: baby girl + husband being out of town a lot for work + science deadlines = very little sewing time). I did get so far as to chose the Flapper Dress as my first victim. I know it’s not one of the patterns I highlighted above as being my favorites, but I have had a beautiful sequins fabric from Distric Fabric burning a hole through my stash for half a year now (see top photo above). 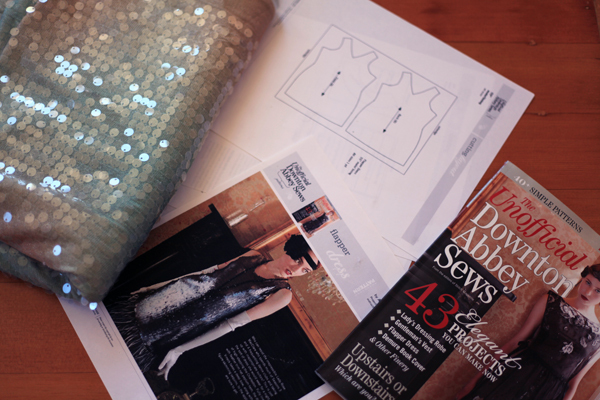 I’ve been looking for the perfect dartless dress pattern since I only wanted to deal with stitching the sequins along the side seams. As soon as I saw this one, I knew I had to give it a chance (again, see top photo above for the line drawing). I’ve gotten as far as downloading the pattern and printing it out. I still need to tape that sucker together (even simple dress patterns require taping a lot of sheets of paper! ), and then I figure I should make a muslin. My sequins fabric is a knit, which means it’ll forgive many fitting issues, but it would still be nice to truly get a sense of how the dress will fit before going through the time and effort of removing all the sequins from the stitching line only to realize something doesn’t work after stitching the side seams together. Once it’s boot season again, I’d like to try the Jodhpurs. I need more skinny jeans, and I like the equestrian seaming details. I’ve tried to zoom in and lighten the photo below so you can see what I’m referring to. Look to the inside, just above the knees. And, then after that it’ll be that coat… Definitely that coat! You did a great job of talking up this magazine. I looked at it briefly in teh store, and decided not to get it, but after reading your highlights, I want it! hello Amy! I would love to win this!I’m not a Downtown Abbey fan, but I have to admit, the dresses are truly amazing!! Love your blog! I would LOVE to be entered into this giveaway! Thanks for hosting. I absolutely love the clothes of Downton! I just love the style! I don’t think I have wanted a magazine this badly before. Where can this be bought for those who don’t win? You can definitely buy it online here. Oh, I love the Jodhpurs! I can definitely also use some skinny jeans, so I’d love to try these! Thanks for the chance to win a copy! I haven’t seen this magazine anywhere near me. It looks fabulous. Thanks for the giveaway…and the link to purchase. Great giveaway! I got hooked into Downton Abbey really late, but now can’t wait for the next season to air! I usually knit while I watch TV, but Downton Abbey is one of the few shows where I put everything down so I can really study and appreciate the costumes. This magazine looks beautiful and I’d love to win a copy. Thanks for a fun giveaway! 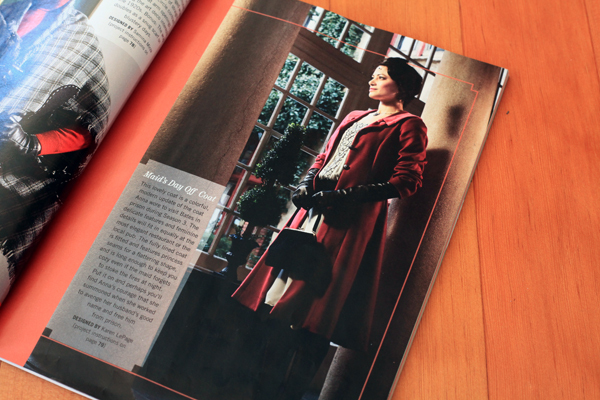 Owwwww – Downton Abbey sewing magazine *squeal*! I’d love to win a copy, I’m really teased by your photos! Also wanted, I am a fan of the show! I would love to win this magazine–thanks for the chance! What gorgeous patterns!!! Can’t wait to see your sequinned dress! Thanks for the giveaway. I would just LOVE to win this — had seen the advert for the magazine and really like their designs. The sequinned dress would be great for Gatsby nights and swing dancing!! Gorgi-liciusness!!! I am in love with the patterns 🙂 What a wonderful nod to Downton Abbey, and the era. Simply “gob smacked!” Great competition~hope to win! Love that you posted about Downton Abby…one of my favorite shows. But more than that is what you said about getting rid of your TV’S because you were addicted. I’ve been sitting here thinking about it. I spend way too much time on the internet. I’m not going to get rid of it, BUT I am going to limit the time I spend, so thank you for being an inspiration!!!! A gorgeous looking magazine, and I can’t get it in Germany… If you’re open to international participants I’d love to be in! I love Downton Abbey. I actually got my mom and dad both hooked on the show too. They keep asking when the next season is coming out. I would love to enter your giveaway. 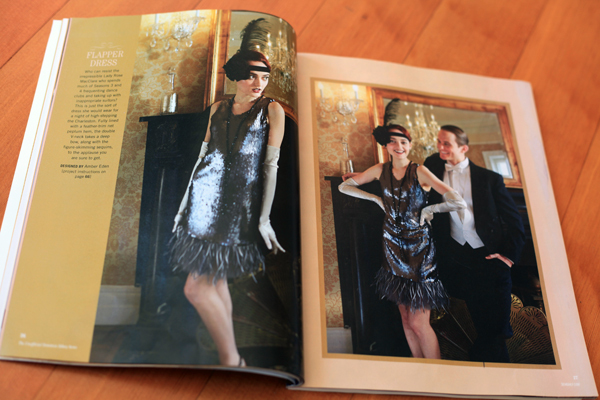 I love Downton Abbey and would love to win a copy of this magazine! Neat! Could. I enter too? 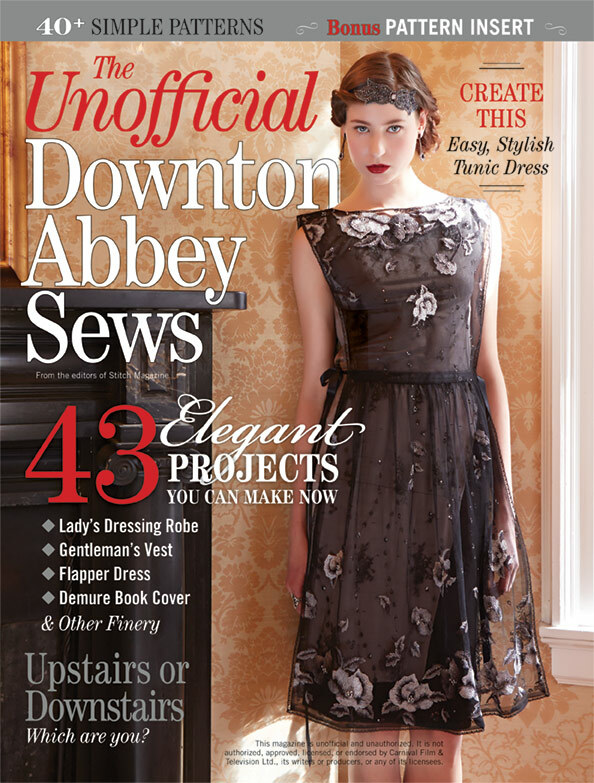 Love Downton Abbey — I’d be curious to try some of the patterns in the magazine. Thanks for the offer! I don’t think I would come out of my sewing room for a month if I had that! Thanks for the giveaway! I’d love to be clad in Downton Abbey-inspired clothes! I haven’t seen the show, but I’d like to be entered b/c the fashions look really cool. I love that high waisted skirt! My husband and I binged on the series last year. We get the DVDs from the library! ahh!! me me me! what an awesome giveaway. I’d love to look through that magazine and make up some downton abbey inspired cloth! Thank you for sharing the issue. 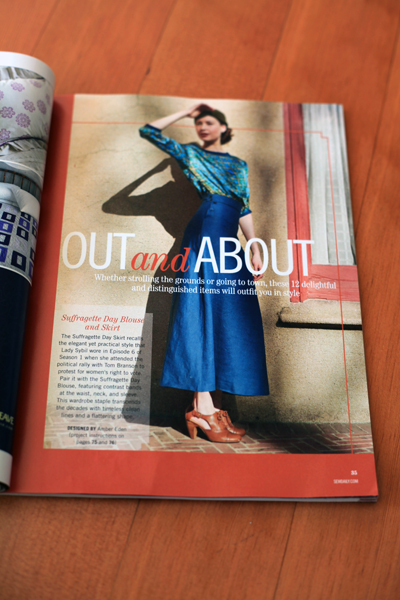 I’m excited to say that I’m one of the designers of the Out & About Wrap on page 36. In your photo above it’s opposite the Maids day off coat :). Please do not pick me…..
Oh congrats! I meant to talk about the designers in my review, but I totally forgot when I was writing it up. I’ll add a link to your wrap as an update to the post! Thank you! Appreciate the link. Don’t watch the show…not much into TV…but loooooooove the fashions! That looks amazing! I love the high waisted skirt and blouse. I love Downton Abbey! Every time, when i’m watching the show, i’m crying, it’s just so beautiful! If you’re open to international participants I’d love to be in! I looooove the 1920s and definitely would enjoy seeing and playing with the patterns that were inspired by that era! I would love to win this as I can’t find it to buy in the UK!! I love the fashions in this era and would love to sew them! Thank you! I almost picked up this magazine the other day, but I’d rather win one! It would be the perfect companion to the fabulous exhibit at Winterthur Museum in Delaware on Costumes of Downton Abbey (not to be missed if one is a Downton fan). Thank you for this opportunity! Ooh! What a fun giveaway! I’d love to win one of these magazines! I love this! Especially those skinny jeans with the detailing. Ooh, I’d love style myself in some downtown threads! Oh my goodness. I didn’t even know this magazine existed. And I am a huge Downton Abbey fan. To be able to make (and wear) one of those dresses would be an absolute dream. And that coat is gorgeous too, indeed! Thanks for the chance to win a copy. I’m not sure if I can enter, since I am all over in the Netherlands, but I sure hope so! Those jodhpurs…I MUST make those jodhpurs!!!! AMAZING! I actually have not seen Downton Abbey…YET! But it’s on my list for when I have enough time to actually sit down and watch TV! I love Downton Abbey and the costumes are always amazing. What a great giveaway!! I recently saw the “Costumes of Downton Abbey” exhibition at the Winterthur Museum in Wilmington, Delaware. The costumes are exquisite. I’d love to have a copy of this magazine. I love the dress on the cover. And the jodhpurs are great too. I never thought I would be looking forward to winter after the long, long, cold one that just ended but those jodhpurs are tempting. I would love this. I see to go to a 20s party about once a year, and never can find anything to sew! What a fun magazine. I would love to have a copy. Hope you get some sewing time soon. 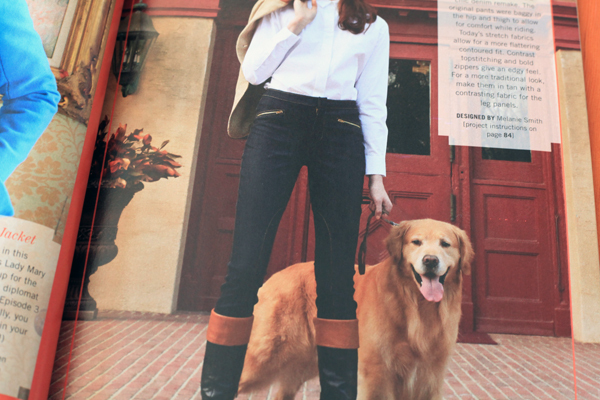 So much to love here – those jean jodhpurs are calling my name. I’d definitely like to win this!!! Lovely! I’ve loved the show and the costumes from the start. I’m at such a beginner level at sewing, but I’d love to try some that gorgeousness! This is so exciting! Thanks for sharing and thanks for the great giveaway! I love the Downton Abbey style. Hi, love watching the show, am in season 3 already. Totally love the coat and skinny jeans. Downton Abbey is one of those shows that I *know* I would love, but I haven’t gotten into it yet. However, beautiful vintage patterns are something I’m definitely into! Thanks for hosting this giveaway! I have not heard of this magazine but, I certainly do want it. I love the style of clothing from the Downton Abbey series (and yeah, I love the series too). What a fun giveaway. Thanks for offering it. Oh. My. Goodness! I’m a swing dancer and have been planning to make an authentic flapper dress–this looks like an excellent starting point! Oh yes please! I’d love the chance to win this. The clothes throughout the series have been absolutely droolworthy. I wish that magazine was sold here. There looks to be a great many lovely things to make. Thank you for hosting such a generous giveaway. Thanks for the chance to win this awesome d.a. book! Oh…I adore Downton. I would love to win. The cover dress is exquisite. I would absolutely love to make that coat. What amazing patterns. The maids coat looks awesome. What fun! I would love to have a copy–the costumes are at least half the reason I watch that show! Wow- I want to make those costumes so badly!!!! excitement! This looks fantastic! Love the show and these patterns are great! Thanks for the opportunity. Love the Jodhpurs! Count me in! Ooh, love love love it! That long high-waisted skirt is beautiful! I miss Downton Abbey…when will it be back? This looks like fun! High brow soap opera…love the show. Those pants are pretty great looking. Need to know how to makes some of these dresses. My daughter has decided to do her wedding in a theme and she chose 1920s Downton Abbey style. Help me find the patterns or the magazine. How fun! 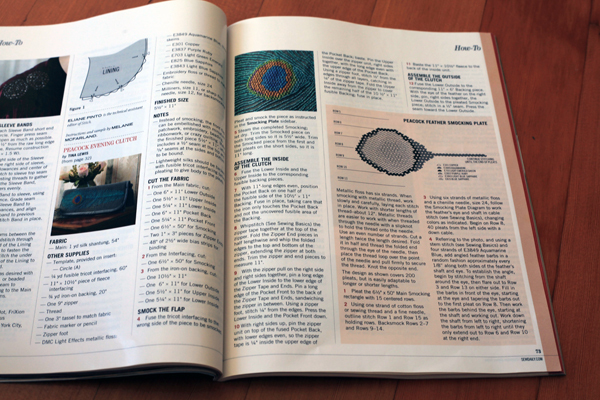 All of the patterns in the magazine can be downloaded for free from here. Hopefully you’ll find downloading the patterns you like to be straightforward, but let me know if you need a bit more help!